On the storied Road Atlanta circuit, Porsche has scored its first ever outright victory at the long distance classic – and secured all championship titles in the GTLM class of the United SportsChampionship. Having to deal with torrential rain at times, Patrick Pilet (France), Nick Tandy (Great Britain) and Richard Lietz (Austria) beat all of the more powerful and lighter sports prototypes in their Porsche 911 RSR fielded by Porsche North America, which is based on the seventh generation of the iconic 911 sports car. It was the first time a near-production GT vehicle had claimed overall victory in the most important sports car series on the North American continent. All good things come in fours: Patrick Pilet and Nick Tandy fought hard for the fourth win of the season with the 911 RSR after Bowmanville, Road America and Virginia. This latest success after the other most important long distance classics in the USA at Daytona and Sebring marks a milestone in the career of the Porsche works drivers: The Frenchman pocketed the title of the United SportsCar Championship drivers’ classification, and the Briton succeeded in clinching both the 24 Hours of Le Mans and Petit Le Mans with Porsche in one season – in two different classes. The start of the 18th edition of Petit Le Mans was dominated by the spectacular chase through the field of Porsche North America’s 911 RSR. Although it had set pole position in the previous day’s qualifying, both Earl Bamber and Nick Tandy had to start from the back of the field. After an off in the qualification, the chassis of the New Zealander’s car had to be swapped overnight. During the technical scrutineering, the ride height of Tandy’s 911, which had posted the second quickest time, was found to be too low. In compliance with the regulations, the Le Mans winner was relegated to the back of the grid. But not for long: Earl Bamber started from position 32 but after just one lap was running in 25th. After two laps, the New Zealander had ploughed through the GTLM field to sit sixth. In his slipstream, Nick Tandy first outpaced the GTD prototypes and then proceeded to pick off his GTLM rivals: After 16 laps he swept into the lead and at times even managed to clock quicker lap times than the considerably more powerful sports prototypes. Prior to this, however, the race had been interrupted after just two laps by the first safety car phase. The flooded track caused huge problems for many of the drivers, regardless of the class. The organiser dispatched special trucks out on to the track, which attempted to blow the water from the circuit with massive turbines. But these measures proved no match for the torrents that formed in many places by the driving rain. As time went on, the rain became torrential and the conditions increasingly challenging. After an hour, Nick Tandy moved into the overall lead for a few laps for the first time. In the meantime, Earl Bamber had to come in for an unscheduled pit stop. The water temperature in his 911 RSR was rising so some tape had to be removed from his radiator. His second stop was due to a puncture – after an encounter with a GTD vehicle in the opening lap. Because he was forced to come into the pits, which was actually not allowed, he received a 60-second stop-and-go penalty. This cost him four laps and robbed him of the chance for victory. Bamber was ultimately flagged off as eighth in the GTLM class. The number 91 Porsche 911 RSR, which thanks to the rear-engine concept benefited from its excellent traction on the flooded track, continued its strong performance now with Patrick Pilet at the wheel. The Frenchman even held the overall lead between laps 135 and 152. When the rain became heavier, even the untiring efforts of the marshals were not enough to drain the water from the track. After five hours and 21 minutes, the race was red-flagged, and the vehicles stood waiting in the pits like a string of pearls. Eventually the field was sent back out on the track to turn two formation laps behind the safety car. Patrick Pilet in the lead handed the 911 RSR off to Nick Tandy under yellow. Once the field went green, he moved from fourth to third before his pursuit was halted by the ninth safety car phase. But he didn’t let this hold him back. In the first lap after the restart, the Frenchman snatched the lead in his class, was running in first overall after 190 laps and never looked back. Because conditions were deteriorating even more, the ten-hour race was stopped after another safety car phase after 7:51 hours and 199 completed laps. Petit Le Mans marked the last race for the American Porsche customer team Falken Tire. With Wolf Henzler (Germany) and Bryan Sellers (USA), Falken Tire has celebrated many successes in the American Le Mans Series and in the United SportsCar Championship, including class victories at the Petit Le Mans in 2013 and 2014 and this season in the six-hour race at Wartkins Glen. 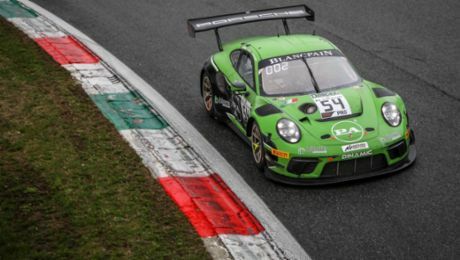 At their farewell race, the blue and green 911 RSR with the starting number 17 was at times running second in class and finally saw the flag in seventh. Porsche customer teams celebrated a double victory in the GTD class with the Porsche 911 GT America. Victory went to the Americans Patrick Lindsey, Spencer Pumpelly and Madison Snow competing for Park Place Motorsports. Magnus Racing drivers John Potter and Andy Lally (both USA) and Robert Renauer (Germany) scored second place. At Petit Le Mans, the new 911 RSR scored the first two championships. At Petit Le Mans a difficult season for Porsche in the IMSA has come to an end.